Gardeners always tend to talk quite a lot about the weather. In many parts of Australia over the last few years we feel we’ve had plenty of reason to complain about it. In our garden we lost more rhododendrons during last summer and the first part of autumn than in any previous year, and perhaps many other members had a similar experience. At least we haven’t had to confront the scourge of Phytophora ramorum, which has been causing gardeners such heartache over the loss of rhododendrons and other woody plants in the northern hemisphere. As the old saying goes: “where there’s life there’s hope”, and most of us go on replanting. Optimism about new acquisitions confronting the frustration of losing old favourites. Or maybe just replacing lost favourites providing we can locate a source from which they can be obtained. 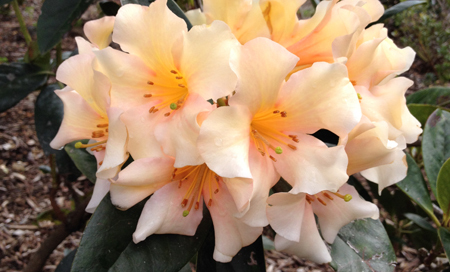 Still persevering, and enjoying rhododendrons when to most others they are an unfashionable – and impractical – choice for Australian gardens.